It’s basically a column (size of your choice) in which you can add the other modules. As the title says, it’s for text. It’s powered by the same WYSIWYG editor you’ve used in the admin (when adding a post for example). It also allows you to write HTML code. Similar to the “Text” module but there is no WYSIWYG editor, just a simple text area. This module is no longer relevant since the “Text” module now supports HTML (which was not the case at the beginnings). These are all modules that are meant to be used for “Post Templates” (if you’re unsure what these are, check the table of contents on the left) but will work for pages as well. The output of these modules is dynamic, based on the currently shown post/page. Most of these are pretty much self explanatory. The title of the currently shown post/page. The excerpt of the currently shown post/page. The content (the main content from the WYSIWYG editor) of the currently shown post/page. The featured image of the currently shown post/page. Meta information such as publish date, author name, categories, tags, the number of comments. Comments listing for the currently shown post/page. Comment form for visitors to leave comments. This is specific to the “Downloads” post type that comes with Live Composer. Displays a button which when clicked starts the download of the file associated with the shown download post. The file is set when adding/editing a download post in the admin (check screenshot below). This is specific to the “Galleries” post type that comes with Live Composer. Displays a slider with images associated with the currently shown gallery post. The images are set when adding/editing a gallery post in the admin (check screenshot below). Does the same thing as the previously mentioned “Gallery Slider”. This is specific to the “Staff” post type that comes with Live Composer. Displays social links for the currently shown staff post. Setting the links is done when adding/editing a staff post in the admin (check screenshot below). Tabs are quite a common element on websites. Like tabs, accordions are a common element. Let’s say you’re building your website and you made a landing page with Live Composer, this module can be used to show at which stage you are. But it’s not limited to that usage, it can be also used to show how skilled you are at specific things. Often referred to as “service box”. The past few years there’s no theme without this element. Display an image from the WordPress Media Library. Also known as “Menu”. In WP Admin > Live Composer > Navigation Module, you can create new menu locations which will be available in WP Admin > Appearance > Menus. Display an icon. Over 600 icons available. Display links to your social website accounts. A simple separator to put horizontal space between modules. These are all modules which display a listing of posts from a specific post type ( several custom post types come with Live Composer ). Needs no explanation, blog posts are a default WordPress post type. The Blog module displays a listing of those posts. These are not blog posts. This module displays a listing of a specific post type you choose. All post types area available, including all custom post types registered by Live Composer, a theme or some other plugin. But, you should only use it to display post types for which there is no dedicated module. All custom post types that come with Live Composer have a dedicated module, more info on that below. Projects are a custom post type in Live Composer. It’s meant to be used for portfolios. You can manage projects in WP Admin > Projects. Everything is the same as when adding a blog post, there is just 2 additional custom options. They’re located below the main text editor when adding/editing a project. Project URL – If you want to link the projects in the listing to a specific URL instead of the single project page you can enter that URL here. Then in the Functionality options for the module set Link option to Link to custom project URL. Images – You can set images for the project and then display those images on a single project page using the Project Images Slider module. Projects are a custom post type in Live Composer. You can manage galleries in WP Admin > Galleries. Everything is the same as when adding a blog post, there is just 1 additional custom option. It’s located below the main text editor when adding/editing a gallery. Images – You can set images for the gallery and then display those images on a single gallery page using the Gallery Images module. Downloads are a custom post type in Live Composer. It’s meant to be used for downloadable files. You can manage downloads in WP Admin > Downloads. Everything is the same as when adding a blog post, there are just 2 additional custom options. They’re located below the main text editor when adding/editing a download. 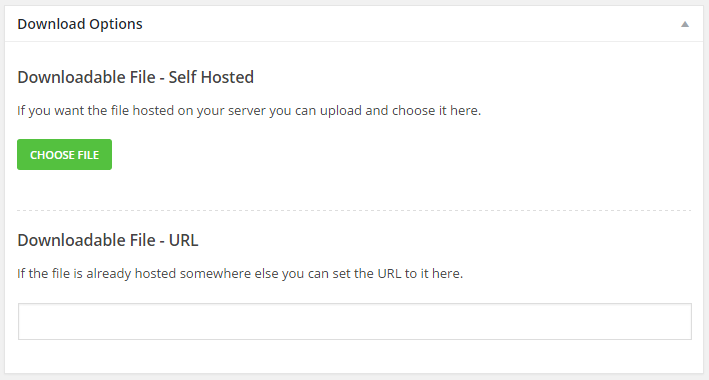 Downloadable File – Self Hosted – If the downloadable file is located on your server ( in the WordPress Media Library ) here is where you can choose that file. Downloadable File – URL – If the downloadable file is located outside of your server ( outside the WordPress Media Library ) you can enter the URL to that file here. Testimonials are a custom post type in Live Composer. If you offer a service or a product you can use them to show what your users/customers think about it. You can manage testimonials in WP Admin > Testimonials. Title of the testimonial should be the name of the person whose testimonial it is. Content is the actual testimonial. Featured Image is the picture of the person whose testimonial it is. Other than those default WordPress fields there is 1 custom option. Staff is a custom post type in Live Composer. If you have a team of people this is what you can use to show information about them. You can manage staff in WP Admin > Staff. Everything is the same as when adding a blog post, there is just a few additional custom options. They’re located below the main text editor when adding/editing a staff member. Position – Here you should enter at which position is this staff member working at. For example “Lead Developer”. 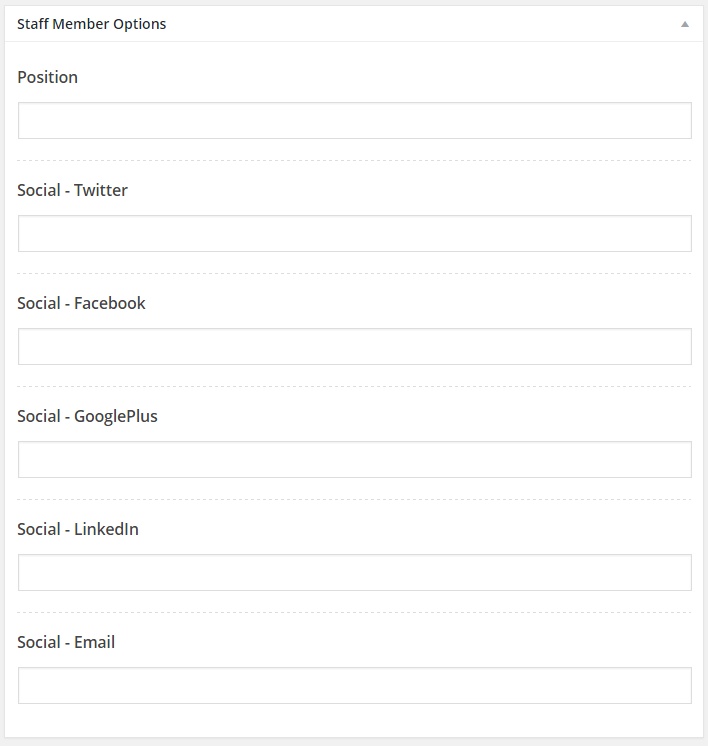 The Social Options – There are several social fields, that is where you can enter the URLs to the social accounts of that staff member. Those will show up just below the thumbnail in the Staff module. Partners is a custom post type in Live Composer. You’ve seen on many websites logos of sponsors/partners being displayed, that is what for the Patners module is for. You can manage partners in WP Admin > Partners. Everything is the same as when adding a blog post. This module displays a listing of WooCommerce products. Management of products is the usual WooCommerce management. Please note for a full Woocommerce integration you will need to use this premium extension.